Yosemite's Scenic Wonders is located within minutes of Mariposa Grove – home of the California redwood trees! California redwood trees, giant sequoias or "the big trees" ... by whichever name you know the giant redwood trees of California, these massive living things are one world wonder you don't want to miss on a trip to Yosemite National Park. Two species of giant redwood trees can be found in California; Yosemite is home to the variety known as the Giant Sequoia. Measuring an average of 300-350' tall and boasting a diameter of 20', these behemoths can be as wide as a city street and, incredibly, as tall as the Statue of Liberty. Much like the Statue of Liberty, a visit to the redwood trees is truly a once-in-a-lifetime experience. When you set out to take in the Giant redwood trees of California, pack your camera and head south to the park's Mariposa Grove. Conveniently located near Yosemite's south entrance, Mariposa Grove is home to the Grizzly Giant sequoia, a leisurely 0.8 mile walk from the main parking lot. At the Grizzly Giant, bask in the grandeur of these stunning trees and step inside to really get a feel for the immensity of a California redwood tree. Giant Sequoias are commonly considered the largest living things on Earth, due to the fact they are the tallest and are the biggest in width. Giant Sequoias only grow in California's Sierra Nevada Mountains. 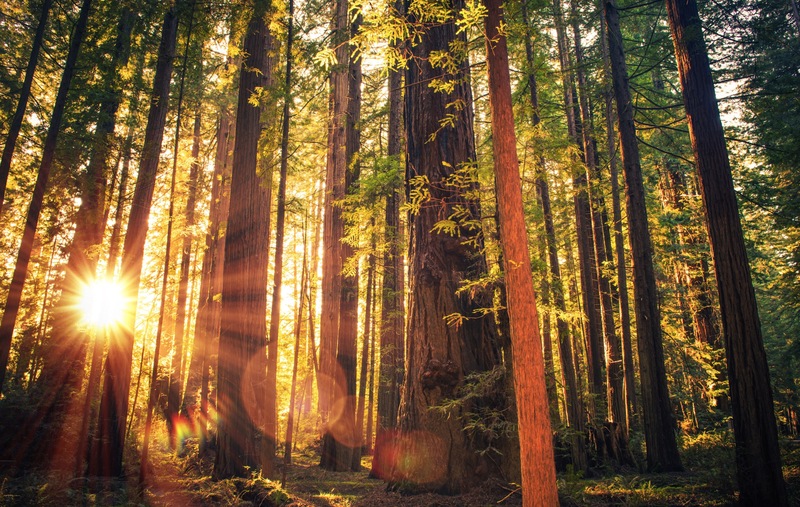 The oldest known giant redwood trees in California are more than 3,000 years old. The bark of Giant Redwood Trees can be as thick as 4 feet, and helps make them fire resistant. In addition, fires actually help redwoods survive by wiping out smaller trees that would eventually take over. It is illegal to cut down a giant redwood tree. The redwood tree's famous concentric circles do indicate the age of the tree, but some the rings are so small they are invisible to the naked eye. Giant Redwood Trees can grow 1-2 feet per year until the tree reaches 200-300 feet. Are you looking to lodge inside the gates of Yosemite National Park so that you can visit the California redwood trees? 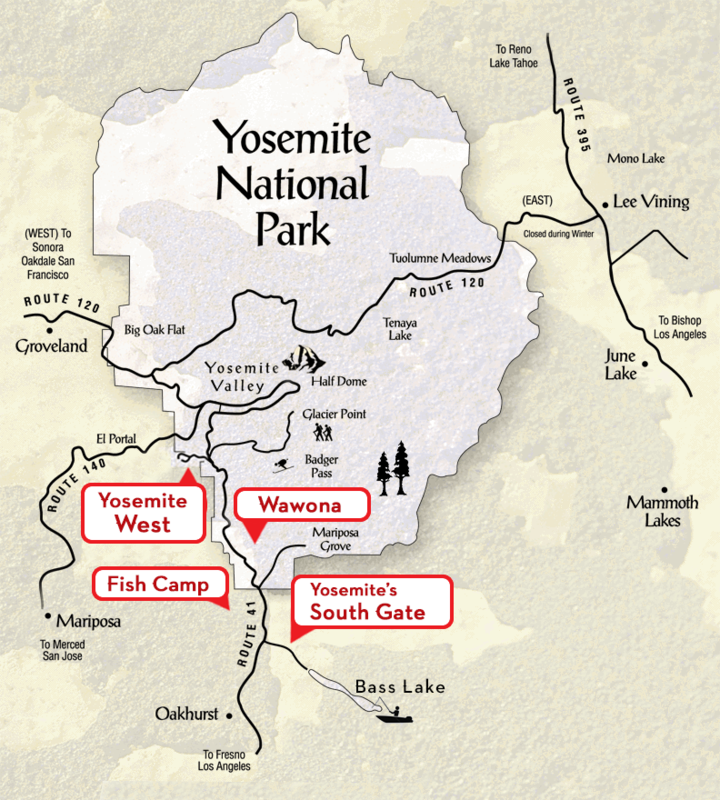 If so, you should rent a home, cabin or condominium from Yosemite's Scenic Wonders. Our location simply cannot be beat! Call 1-888-YOSEMITE (1-888-967-3648) or make your reservation online today!